This the face of cancer. You are the face of hope. Why is finding a cure so important? Every year, thousands of families receive the devastating news that their child has cancer. The emotional and financial toll is overwhelming. Not only must families confront a new reality which includes words like "chemotherapy," "transfusions," and "surgical procedures," but they must often deal with time away from work and family. Our goal is simple. To make their lives a little easier, by providing support in a time of crisis, and to let these families know that they are not in this alone. But we can't do it without your help. Please join us in helping these little warriors. To help children and families who are fighting pediatric cancer. To raise awareness of pediatric cancer and its issues. To help fund pediatric cancer research, in the hopes that a cure can be found for this disease. We also donate to fund pediatric cancer research, and participate in a variety of activities to raise awareness of pediatric cancer. Sadie’s Dream for a Cure has mobilized a small army of volunteers throughout the country who sew “Busy Bags” – fun, fabric tote bags – which we fill with toys, books, and other items that a child can play with while going through chemo, attached to I.V.s, or in isolation. We also make and distribute “Basics Bags” – parent bags filled with basics such as toiletries, snacks, and comfort items for parents for use during expected hospital stays with their child. 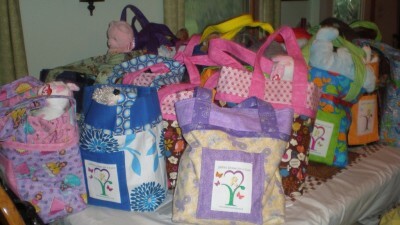 These bags are distributed to pediatric cancer centers throughout the country. Our goal is to make someone’s day a little brighter and bring some joy to a child who is fighting cancer. "Our daughter received one of these beautiful bags today after a night/morning of scary things due to an emergency stay. When she saw that it was for HER, she got the biggest smile and couldn't wait to play with everything - and was finally able to focus on something fun instead of how scared she was. Her favorite is a stuffed pony she named Maddie that has helped her to not be so nervous. Thank you so very much!"